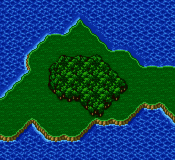 Phantom Village is nestled in a small forest in the center of the southern arc of the peninsula. It’s not immediately visible as a town since it doesn’t haven a village icon associated with it. Wander around the forest and eventually you’ll wind up in the town that time forgot. The Phantom Village was sucked into the Interdimensional Rift 1,000 years ago. The citizens suspect that the rift is returning since time ceases while they’re in the void. How they know that time has stopped for 1,000 years is anyone’s guess. Regardless, be glad they’re back. This town sells the best weapons, armor, and magic in the game. But you will have to hunt a bit for it. There are two dealers for each shop, but the second one is usually a bit tricky to find. The first building you come to is the inn. Since the village is located off the beaten path prices are steep at 70 Gil a night. If I were you I’d forego the comfortable bed and wander about the town a little bit. You’ll find a healing pot in the basement. Two merchants have taken up shop above the inn. The first one sells the usual assortment of curatives. He carries little of interest unless you’ve got a raging case of poison, or are turned into a frog or a statue. The second shop is more interesting. At first glance the peddler looks to be hawking chemist drinks and little else of value. Heading up the list for more than most people would pay for a firstborn child is an Elixir. You can finally purchase this holy grail. 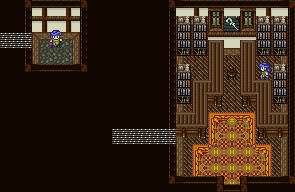 If you’ve come to the shop with a thief in your midst, you’ll notice two passageways leading off to the left. The bottom one terminates in a dead end, taunting you with visions of an unreachable store. How do you get to the top one behind the merchant? He obviously won’t tell you. Examine the crate in the store and you’ll be rewarded by the thud of the counter shifting over to let you run through to the next shop. If you’ve been pining for the rings sold in Istory way back in Bartz’s world, pine no longer. All three of them are for sale here as well as a new relic: Hermes Sandals. The sandals cast haste. I find them especially useful for berserkers who wield giant axes very slowly. The other two items are slightly less exciting. The Lamia’s Tiara increases mpwr by 3, and increases the possibility of performing Sword Dance with your dancer. The Angel Robe is a nice article of clothing, protecting its wearer from poison, but since only chemists, mimics, and the freelancer class can wear it, it’s virtually useless. The main magic shop carries all of the spells that you may have missed along the way, or forgotten to buy. If you’ve been diligent about collecting magic, you’ll probably be disappointed. Once again if you have a thief in your party you will spy a passage to the left of the shop alerting you to the presence of the second vendor. The passage itself is a dead end. From the entrance to the first magic shop, walk west, and then north along the side of the building. When you reach the top, turn right. This vendor sells level 6 spells. If you can only afford one, I’d reserve my 10,000 Gil for Arise. The rest of the spells are lovely to have in your repertoire, but aren’t strictly necessary. What an arms dealer. This shop sells some tough weapons. You probably have one or more of most of them with the exception of the Kiku-ichimonji and the Rune Bow. Unfortunately there’s nothing here your mages will benefit from, but they should be well equipped with the boosts from the armorist. 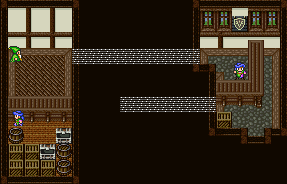 The large tavern looks almost deserted with only three patrons. They all spout nonsense too. One talks to you about the Phoenix Tower. A drunkard recites a poem that neither rhymes nor has obvious meter. And the third spouts off about the apocalypse. There’s not even a piano in the joint. Look behind the bar, at the northern end there’s a door. It should be labeled employees only, but since it’s not, feel free to go outside and around the building and enter. Talk to the crazy bartender and then examine the row of barrels. Only one is worth your time. The second barrel from the bottom contains a Thief Knife. The Thief Knife makes its bearer more agile by 1 increases steal percentage and also randomly mugs its target. With your treasure in hand, exit using the stairs. There’s nothing else of note here. You’ll meet a man down the stairs who has a gift for you if you can complete his task. He wants you to go around the world on a yellow chocobo. This means running with Boko around the peninsula and back again to where you started. Most likely Boko is waiting patiently outside of Ghido’s cave. Fly back there using the airship and mount up. From Ghido’s cave go west and follow the shore north. When you reach Karnak continue west. Head south towards Castle Surgate. Take the narrow pathway around the cavernous void that was the Library of the Ancients. Follow it through a forest. Skirt Quelb village and keep going. If you see Castle Bal, shift eastward a bit until you see another break in the mountains leading south. Keep going and you’ll emerge on the thin peninsula that arcs around to the east. Wave as you run by Phantom Village and Crescent Village. Once you are off of the peninsula run east along the thin shoreline. Wend west around the vacuous remains of Castle Tycoon, but keep pushing northward. Head west when you reach the river (remember that Boko can cross rivers now). Wind through the mountain passes and emerge at Tule. Continue west over the river and then south. You should arrive back where you started at Ghido’s Cave. Hop in the airship and fly back to the man downstairs from the pub. He expresses surprise that you completed his request and hands over a Mirage Vest. When you come back from the completed dare, the townsman hints at another location you can visit with Boko, Istory Falls. Wander out into the sunlight and walk south. Enter the door and continue through each chamber. Pause at the pot in the center room. It’s a healing spring. Descend the stairs at the end of the chambers. Walk down the corridor. Ignore the room in the middle of the chamber. It yawns into emptiness. You can’t enter right now. When you visit the void it will function. Instead put on your thief’s Passages ability. And walk left. Don’t go up the stairs yet. Instead continue to the end of the passage where you’ll find the eighth and final piano. Play it, and if you’ve played all of the other pianos you will be hailed as a piano master. You can return to Crescent and collect your rewards. Ignore the stairs leading up again. Instead go back to the room, bypass the center door and continue up the stairs on the right. If you’ve been tapping walls trying to find your way into the back of the weapon shop for its counterpart, you’ll feel foolish since it’s got a real entrance. The merchant caters to ninjas and thieves. You can buy as many Twin Lances as your heart desires. Stock up on ninja scrolls and Shurikens. If you’ve got more money than you know what to do with, you can buy a couple of Fuma Shurikens. They’re the status symbols in the game, kind of like a Mercedes. Back in the basement you can take the left passageway and ascend the stairs. You emerge in a clearing where a lonely black chocobo scurries. Catch him and he’s yours forever. Or at least until you decide to drop him off somewhere again.